Citrus juicers are made specifically for extracting juices from citrus fruits. Whether you are hoping to juice an orange, lemon, lime, or even something as large as a grapefruit, most citrus juicers will be able to accommodate your needs. I sincerely believe that this type of juicer is a must-have for any child looking to start a lemonade stand, any adult who enjoys crisp flavored water, or any bartender who enjoys creating fruity drinks with a twist. Citrus juicers are not, however, suitable for extracting juices from other types of fruits or vegetables. You will not be able to juice apples, pears, pineapples, carrots, or anything which is not a citrus fruit. 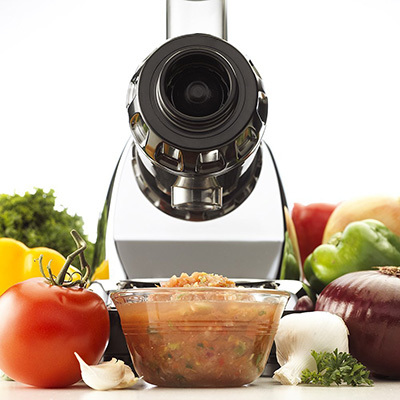 To meet those needs you will need to look into purchasing a centrifugal or masticating juicer. 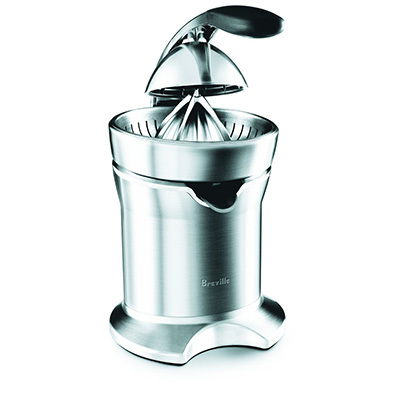 The Breville 800CPXL Stainless Steel Motorized Citrus Press is composed almost completely of stainless steel. Its construction is bound to impress fans of stainless steel appliances and those worried about the potentially harmful effects of using plastic in food preparation. This juicer runs on a quiet, yet sufficiently powerful, 80 watt motor and effortlessly removes juices from citrus fruits with the pull of a lever. The one reamer included with this juicer is advertised as being able to work well for citrus fruits of all shapes as sizes. Two different pulp filters give you the option of no pulp or some pulp in your juice. 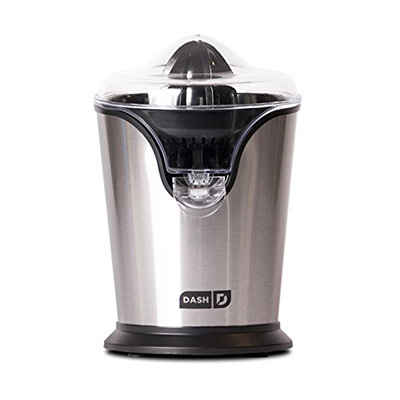 The Dash Dual Citrus Bar is fully capable of juicing an entire citrus fruit all at once, instead of one half at a time like many other citrus juicers. This juice bar features two motorized reamers which spin when pressure is placed upon them. Behind the two reamers is a cup-like holding place where you can slice your citrus fruit. No more sticky fingers and struggling with knives or washing cutting boards. Simply place the fruit in the holding cup and pill the lid down so that the built-in slicer can do the rest. 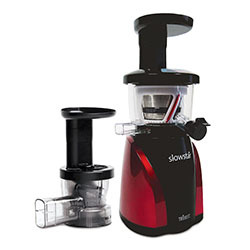 This low-cost juicer features a 90-watt motor and a small, approximately 8-ounce, juice cup. It is able to process small amounts of juice without becoming overheated or burning out. Overall, consumer reviews for this juicer have been favorable. The Dash Stainless Steel Citrus Juicer features a durable and futuristic stainless steel exterior and takes up surprisingly little space on your countertop or inside your cupboard. Its cord storage system also makes it easy to find cupboard and countertop space for this juicer without creating an unsightly and tangled up mess. The two different reamers included with this juicer make it easy to extract juices from all types of citrus fruits, from limes to grapefruits and every size in between. Easy to operate, this juicer works by pressing halved citrus fruits cut-side down atop the reamer. 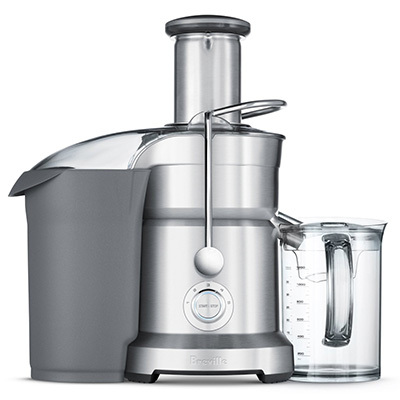 From there the juicer, powered by an 85-watt motor, does the rest of the work for you. 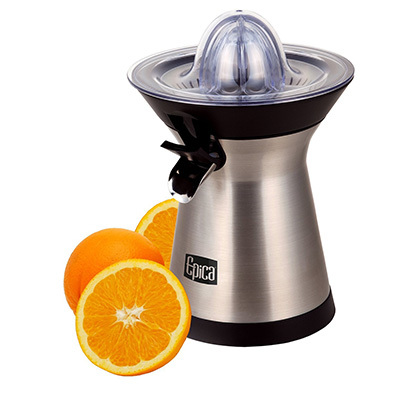 The Epica Powerful Stainless Steel Citrus Juicer features a nearly silent, environmentally-friendly 70-watt motor just strong enough to provide the power necessary for extracting juices from citrus fruits. This juicer features two different sizes of citrus reamers, allowing you to extract juices from limes, lemons, oranges, and grapefruits with ease. 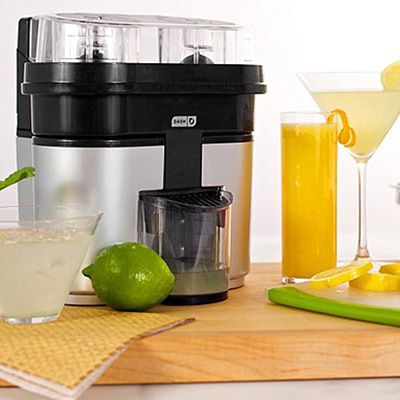 Although not useful for juicing different types of fruits and vegetables, this juicer will make an excellent addition to any lemonade stand or cocktail party. It can be especially helpful for those with hand or wrist problems, such as arthritis or carpal tunnel syndrome, since it takes the difficulty out of squeezing juice from oranges, lemons, and other citrus fruits. The strong stainless steel exterior with its futuristic curves makes this juicer durable and similar in appearance to an alien space craft. This piece will nicely accent any industrial or modern-style kitchen space. 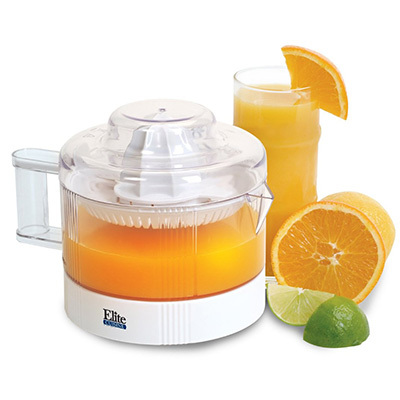 The Maximatic ETS-401 Citrus Juicer boasts a large 20-ounce internal juice storage system located directly below the pulp and seed strainer. Juice flows directly into it, instead of flowing into your glass, allowing you to collect more juice at one time than many traditional electric citrus juicers. The easy-pour spout, large-grip handle, and lockable lid mean that you can easily pour juice into a glass or larger pitcher without worrying about spills, slips, or the lid popping off. Its single pulp filter appears to have holes large enough to allow thick chunks of pulp to flow freely into your juice. Unfortunately, this juicer features a weak 25-watt motor, designed for occasional use but not likely to stand up to large batches of juice or everyday use.